As mentioned previously, today I presented a talk at FOSDEM 2012, titled “Building application sandboxes on top of LXC and KVM with libvirt”. As promised I have now uploaded the PDF slides for public access. For further information about libvirt-sandbox, consult this previous blog post on the subject. Also keep an eye on this site for further blog posts in the future. Thanks to everyone who attended the talk. I look forward to returning again in a year’s time for another update. As many readers are no doubt aware, the FOSDEM 2012 conference is taking place this weekend in Brussels. This year I was organized enough to submit a proposal for a talk and was very happy to be accepted. My talk is titled “Building app sandboxes on top of LXC and KVM with libvirt” and is part of the Virtualization & Cloud Dev Room. As you can guess from the title, I will be talking in some detail about the libvirt-sandbox project I recently announced. Richard Jones is also attending to provide a talk on libguestfs and how it is used in cloud projects like OpenStack. There will be three talks covering different aspects of the oVirt project, a general project overview, technical look at the management engine and a technical look at the node agent VDSM. Finally the GNOME Boxes project I mentioned a few weeks ago will also be represented in the CrossDesktop devroom. Besides these virtualization related speakers, there are a great many other Red Hat people attending FOSDEM this year, so we put together a small flyer highlighting all their talks. In keeping with the spirit of FOSDEM, these talks will of course be community / technically focused, not corporate marketing ware :-) I look forward to meeting many people at FOSDEM this year, and if all goes well, make it a regular conference to attend. I have mentioned in passing every now & then over the past few months, that I have been working on a tool for creating application sandboxes using libvirt, LXC and KVM. Last Thursday, I finally got around to creating a first public release of a package that is now called libvirt-sandbox. Before continuing it is probably worth defining what I consider the term “application sandbox” to mean. My working definition is that an “application sandbox” is simply a way to confine the execution environment of an application, limiting the access it has to OS resources. To me one notable point is that there is no need for a separate / special installation of the application to be confined. An application sandbox ought to be able to run any existing application installed in the OS. For a few Fedora releases, users have had the SELinux sandbox command which will execute a command with a strictly confined SELinux context applied. It is also able to make limited use of the kernel filesystem namespace feature, to allow changes to the mount table inside the sandbox. For example, the common case is to put in place a different $HOME. The SELinux sandbox has been quite effective, but there is a limit to what can be done with SELinux policy alone, as evidenced by the need to create a setuid helper to enable use of the kernel namespace feature. Architecturally this gets even more problematic as new feature requests need to be dealt with. As most readers are no doubt aware, libvirt provides a virtualization management API, with support for a wide variety of virtualization technologies. The KVM driver is easily the most advanced and actively developed driver for libvirt with a very wide array of features for machine based virtualization. In terms of container based virtualization, the LXC driver is the most advanced driver in libvirt, often getting new features “for free” since it shares alot of code with the KVM driver, in particular anything cgroup based. The LXC driver has always had the ability to pass arbitrary host filesystems through to the container, and the KVM driver gained similar capabilities last year with the inclusion of support for virtio 9p filesystems. 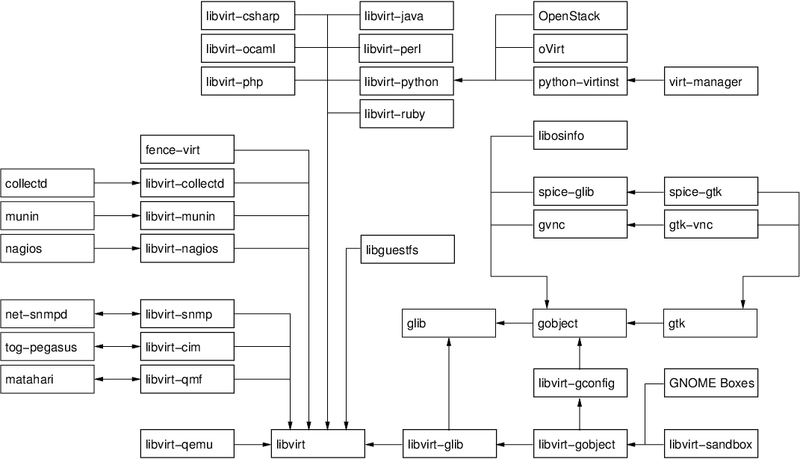 One of the well known security features in libvirt is sVirt, which leverages MAC technology like SELinux to strictly confine the execution environment of QEMU. This has also now been adapted to work for the LXC driver. Looking at the architecture of the SELinux sandbox command last year, it occurred to me that the core concepts mapped very well to the host filesystem passthrough & sVirt features in libvirt’s KVM & LXC drivers. In other words, it ought to be possible to create application sandboxes using the libvirt API and suitably advanced drivers like KVM or LXC. A few weeks hacking resulted in a proof of concept tool virt-sandbox which can run simple commands in sandboxes built on LXC or KVM. A command line tool for running applications inside a sandbox is great, but even more useful would be an API for creating application sandboxes that programmers can use directly. While libvirt provides an API that is portable across different virtualization technologies, it cannot magically hide the differences in feature set or architecture between the technologies. Thus the decision was taken to create a new library called libvirt-sandbox that provides a higher level API for managing application sandboxes, built on top of libvirt. The virt-sandbox command from the proof of concept would then be re-implemented using this library API. The libvirt-sandbox library is built using GObject to enable it to be accessible to any programming language via GObject Introspection. The basic idea is that programmer simply defines the desired characteristics of the sandbox, such as the command to be executed, any arguments, filesystems to be exposed from host, any bind mounts, private networking configuration, etc. From this configuration description, libvirt-sandbox will decide upon & construct a libvirt guest XML configuration that can actually provided the requested characteristics. In other words, the libvirt-sandbox API is providing a layer of policy avoid libvirt, to isolate the application developer from the implementation details of the underlying hypervisor. Building sandboxes using LXC is quite straightforward, since application confinement is a core competency of LXC. Thus I will move straight to the KVM implementation, which is where the real fun is. Booting up an entire virtual machine probably sounds like quite a slow process, but it really need not be particularly if you have a well constrained hardware definition which avoids any need for probing. People also generally assume that running a KVM guest, means having a guest operating system install. This is absolutely something that is not acceptable for application sandboxing, and indeed not actually necessary. In a nutshell, libvirt-sandbox creates a new initrd image containing a custom init binary. This init binary simply loads the virtio-9p kernel module and then mounts the host OS’ root filesystem as the guest’s root filesystem, readonly of course. It then hands off to a second boot strap process which runs the desired application binary and forwards I/O back to the host OS, until the sandboxed application exits. Finally the init process powers off the virtual machine. To get an idea of the overhead, the /bin/false binary can be executed inside a KVM sandbox with an overall execution time of 4 seconds. That is the total time for libvirt to start QEMU, QEMU to run its BIOS, the BIOS to load the kernel + initrd, the kenrel to boot up, /bin/false to run, and the kernel to shutdown & QEMU to exit. I think 3 seconds is pretty impressive todo all that. This is a constant overhead, so for a long running command like an MP3 encoder, it disappears into the background noise. With sufficient optimization, I’m fairly sure we could get the overhead down to approx 2 seconds. Assuming libvirt is already installed & able to run either LXC or KVM guests, everything is ready to use immediately. Notice how we only see the processes from our sandbox, none from the host OS. There are many more examples I’d like to illustrate, but this post is already far too long. Turn the virt-viewer command code for SPICE/VNC into a formal API and use that to provide a graphical sandbox running Xorg. For those attending FOSDEM this year, I will be giving a presentation about libvirt-sandbox in the virt/cloud track.